I can’t help thinking that at least part of that camel’s hump is resting somewhere very uncomfortable. Though the camel, at least, seems to be enjoying it. And now back to our regularly scheduled Trump jokes. This has gotta be a wraparound. What Baen madness is on the other side? We’ll be all waiting with bated breath to find out if this makes it into the new TV series. Imagine it! A TV show made up of living Baen covers! Accepting that there will never be a Beatles reunion album, George Martin turns his hand to editing cheesy science fiction. Keep an eye out for those string sections! Trump as Fortunato without any morality or humanity, but definitely a larger stable of prostitutes. Ssannah Hoffs finding out why Egyptians walk that way. Valerie Coupland: Thought for a moment there that you were commenting on the implausibility of a Baen cover that wasn’t orange. Is it just my ageing eyes, or does the camel have five legs? @LL: Don’t be ridiculous. The camel has six legs. @THX 1138: So the camel is related to Sleipnir, then? 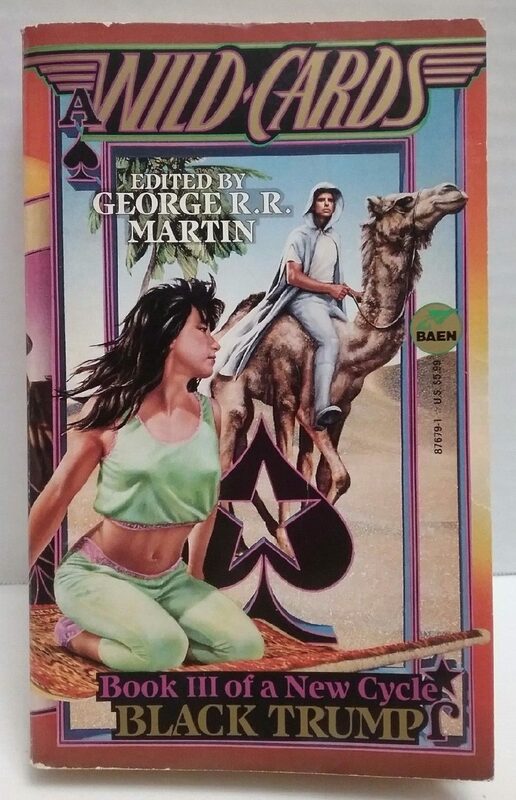 Should have used ‘new deck’ instead of ‘new cycle’, unless a six legged camel is considered the motorcycle of the desert and not the ship of the desert. Okay, loving the new “camel” tag. Wonder if there were any previous? Is there a “frame” tag? She’s broken through it. What’s with damsel’s shoulder? Or is it an acknowledgement that women can’t actually pose in the way they are on many comics/SFF covers? (checks publisher) Naaahhh. Just incompetence. Hoodie man must be regretting not having a camel saddle. Do the extra legs make the ride smoother or worse? @THX (1): We really could have closed the comments there. GSS! @LL: Only a little orange around the top, gasp! Still, this was 23 years ago — the Before Time when they were allowed more colors. I guess all the orange lately is presaging/honoring their feudal master to whom @Valerie referred. @Anna T: More closely related to a camel spider. Helpful tip: don’t Google camel spiders.